“If I’m going to sing like someone else, then I don’t need to sing at all.” So said “Lady Day,” Billie Holiday (1915-1959). Her voice was raw, raspy, rugged – and riveting. She sang like no one else. Love her or hate her, there’s no denying her innovative sense of phrasing, her gift for creative improvisation and the unconcealed emotion that comes across in every note she sang. All this without any technical training. In 1939, she co-wrote God Bless the Child, a song that’s been covered by countless artists and been referenced in so much popular culture, it’s difficult to imagine that there’s anyone out there who’s unaware of it. Another song inextricably linked with Billie Holiday is Lewis Allan’s Strange Fruit, which protested the lynchings of black Americans. She could have sung it with furious outrage, but in her hands it’s a lamentation, hauntingly anguished, beautifully rendered. It reaches into your very soul, to the core of your being. It’s a tragic masterpiece. With no father and an often-absent mother, Billie Holiday (born Eleanora Fagan) had a fractured childhood. She dropped out of school and by age 13 was working in a brothel along with her mother. She served time in prison after the brothel was raided by police. Just a girl, she already had a bucketload of life experience. She changed her name and – inspired by the great Bessie Smith – began singing around small clubs in New York. At 18, she made her first recording as the vocalist with a group led by the soon-to-be-famous Benny Goodman. On the strength of Your Mother’s Son-in-Law and What a Little Moonlight Can Do, she scored herself a recording contract. Billie sang with many of the biggest names in jazz: Lester Young, Teddy Wilson, Count Basie, Artie Shaw, Ray Ellis. Indeed, she was one of the biggest names in jazz herself. Whatever she sang, she turned it into jazz – I Can’t Believe That You’re in Love With Me, Summertime, Come Rain or Come Shine, all the standards. One of the great things about any Billie Holiday record is that they are as much about the musicians as they are about the vocalist. It was a team effort. She may have had a lot to say about what to play but she didn’t hog the limelight. Good Morning Heartache, Lover Man, You’ve Changed – doleful ballads about failed love turned out to be sadly relevant to her. She was a remarkably poor judge of men; her partners were abusive, exploitative and unscrupulous. All three husbands of her husbands were using narcotics, and she too became addicted to drugs. She was also drinking to excess. Naturally this took a toll on her voice, which lost some of its clarity but never its inherent pathos. It was huskier and more plaintive, but still inescapably Billie. In 1959, Billie was admitted to hospital for liver and heart disease, as well as heroin addiction. While lying in her hospital bed, she was again arrested for narcotics possession and apparently was even handcuffed at one point. No mercy from the authorities, that’s for sure. 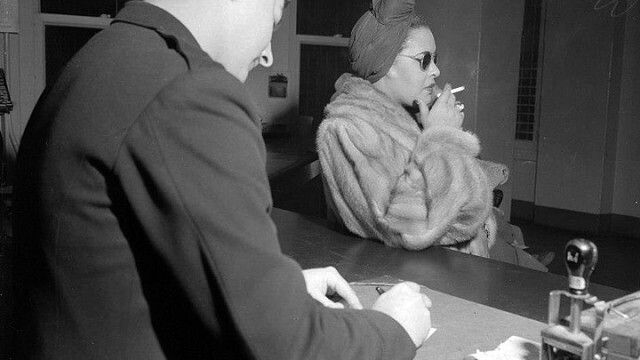 Billie Holiday died in July 1959, her body a wreck. In her autobiography Lady Sings the Blues (1956), written with William Duffy, she openly discussed her substance addictions. Although the book is not entirely factually correct, it is a fascinating read and offers a bit of an insight into her troubles. Billie Holiday recorded over 300 songs. Many are upbeat and, dare I say joyful, but to me she’ll always be tragic Billie, the girl with the white gardenia in her hair, the girl who sang from her gut and who at just 44, sang no more. Even though I love my Jazz, believe it or not, I wasn’t familiar with “God bless the Child”. Now I am, thank you Loretta, what a great track. I am also very appreciative of your “Know who you’re Googleing” series. Great work, thanks.